I'm thinking of changing the layout on RRCB ever so slightly. I decided to use a brown and a green as the constants and liked the look of the dark triangles on the inside of the blocks instead of the outside. I think it gives it a bear claw kind of look and ties into the string blocks nicely. What do you think? The original quilt layout is here for comparison. 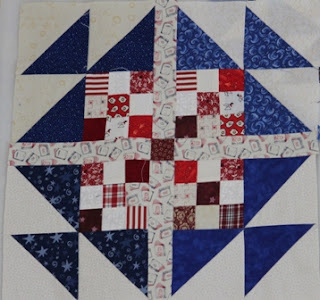 I also can't find the three patches from Part 1 of the mystery and so am thinking of skipping the pieced border all together. I am becoming scrap happy Saturday Challenged. I rushed off this morning to a group quilt along and completely forgot that it was Saturday AGAIN. You wouldn't think it would be so hard to know the days of the week, but summer vacation can be confusing that way. So I've got all the bits and pieces made for Goose in the Pond, but only two complete blocks have come out the other end. The quilt along was great. 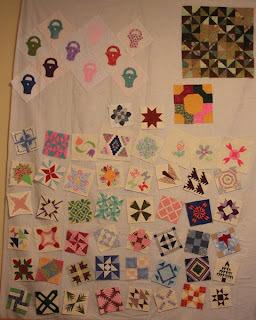 I didn't take a single picture of course, but was busy pinning quilts together all day. I think the grand total was somewhere around 150 quilts for the day with about 50 people coming and going for some portion of the day. The group is called Eduquilters and there were lots of kids there who participated in a summer quilt camp earlier this summer. I volunteered to bring home the scraps and see if I can turn them into pieces for more quilts. Use the linky box below to show your own Saturday goings on, or Sunday goings on for those of like me with trouble knowing the day of the week. I guess I have some chain piecing to look forward to! I spent two and a half movies last night getting 600 HST units cut out. Of course I was watching the movies during some of that time. First up was About a Boy with Hugh Grant, which I had never seen. Then it was An American President which I know by heart, I've seen it so many times. Last up was Guarding Tess, though I fell asleep after the cutting and before the end of the movie. There is an all day quilt event that a wife of a friend of Kurt's from work asked me to come to when she heard I was a quilter. We met at Church last Sunday. The group is making quilts for kids in transition. Last time they got together they made 100 quilts! I didn't think I would know anyone, but when I got the e-mail flyer there was a friend of mine in the pictures. She was at the beach yesterday and was working on recruiting some ladies I knew. Sometimes it occurs to me that I really do live in a small town. It is a good thing. Just four days left of summer vacation and we are wringing out all the fun we can find. Today was a Friday off for Kurt. Ashlyn had put together a group to meet at the beach. Wednesday is the usual summer beach day, but lots of people were able to make it today. Kurt left early for volleyball, but more people kept showing up all morning, making it a great chance to hang out and catch up. We found out Tuesday that we needed to return the board we had been borrowing for Anna which gave us the perfect excuse to finally get her a board of her own. 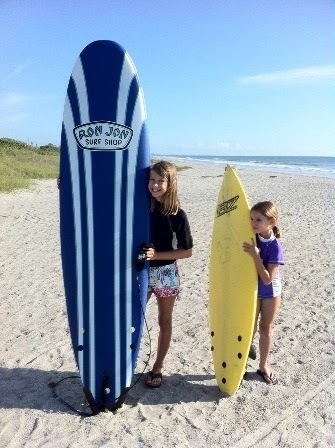 It is a seven foot foam board from Ron John's with a hard bottom and three fins. See how much I've learned about surf boards this summer? You'd think I had been catchin waves my whole life. Everyone was pretty tuckered out by the time we got home and cleaned up. That gave me plenty of time to get a little more work done on RRCB. The string blocks were step three, which is where I gave up in December. I suckered persuaded Kurt into helping de-paper all the string blocks before bed last night. He has also been known to match up dark and light squares and count finished blocks into groups of 10 upon occasion. So with those done, I looked ahead to see what the next step was. A few two patches and some extra green squares. That was easy enough. Now I'm working me way slowly through steps 5 and 6. 600 HST triangles at 2 inches each?! I think I can I think I can. The kids are wanting to watch a little netflix before bed. I guess I'll be cutting triangles for a while. Still working hard to tie up loose ends. 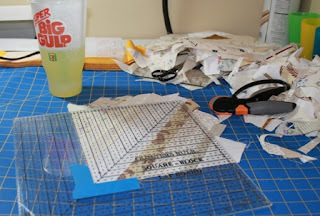 I suppose I should get started on school work in order to be ready for next week, but I would like to leave my sewing room in some sort of order as I know that my time will be limited during the school year. This afternoon I pulled out the basket of white strings which have been patiently waiting for me to get my act in gear on Roll Roll Cotton Boll. It didn't take long at all to finish off the sewing part. Isn't that always the way with procrastination, never as bad as all anticipation. 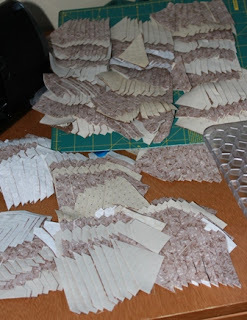 Half of the string blocks have already had the paper torn and trimming done, so it is just 30 more to rip and cut. I'll have to see if there is a good movie on Netflix! The plan all along has been to set the Midgets on an angle and embroider the names below. I was working some projects through the machine today and thought I would do a little experimenting to see how it was going to look. So after messing with the machine for way too long and finally calling the store where I got it so they could remind me how to program the letters, I stitched out the names for the first two blocks. 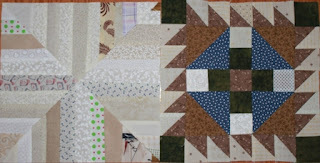 I wasn't sure I liked it, so I then ripped apart the first block which had a wonky "O" anyway and tried it by hand. I'm not sure I like that either, but it might get better with practice. It's too late to buy the next step up machine with the script font I have pictured in my head, so which one looks better, hand or machine? I can't decide which one looks better, or even which one would be easier in the long run. What do y'all think? I head back to school next Wednesday and the kids will be back one week after that. 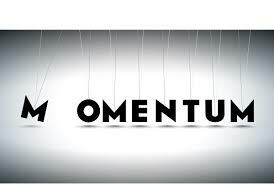 This week has been for getting ready and trying to finish off the loose ends that have been left dangling. Doctors and errands and shopping, so much scurrying around! After an afternoon of sorting through the school supplies we already had on hand, I was left to wonder why we needed to buy anything at all. 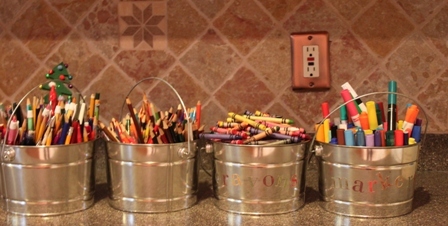 We seem to have plenty of crayons, markers and pencils to supply an entire classroom! Still, we took our list and checked things off, making sure everyone had what was required. They each picked out a first day outfit and we supplemented supplies of necessities like socks and underwear. Anna couldn't remember the last time she needed socks, they just don't go with flip flops! I spent an evening using glue to connect the corners on the bow-ties for Bonnie's challenge. I don't like pins on leaders and enders but have been known to drop the entire basket after getting all the pairs matched up. I only used a dab of glue stick on the outside corner which is going to be trimmed away after ironing anyway. It seems to be working well so far and about a dozen finished blocks have already come out the other end. 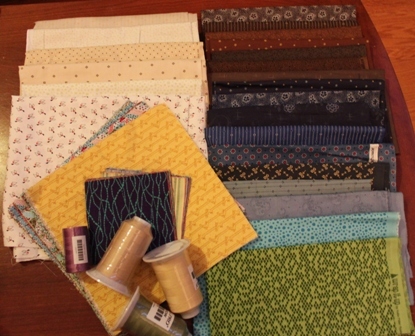 I also got some fabric goodies in the mail. While I was in Georgia with Mom I put in an order to Connecting Threads. I focused on blues, browns and backgrounds. The blues and browns are for RRCB (which I seriously need to get back to) and the backgrounds are just to try to replenish my stock. I also got a few spools of thread for the quilting machine. I got news this morning that one of my former students died yesterday in a motorcycle accident. It was just about this time last year that I was going to a funeral for another teenager who died in a car accident. I've been to far to many memorials for people who should have lived long happy lives. I was so excited to be back in my own home again that I decided to pull out ALL my midgets so far and put them up to see how they look together. I started at the bottom right in chronological order, and as you can see, I ended with lots and lots of applique. Those blocks haven't been trimmed to size yet, so they look a bit a bigger, though the sizes are anything but consistent. 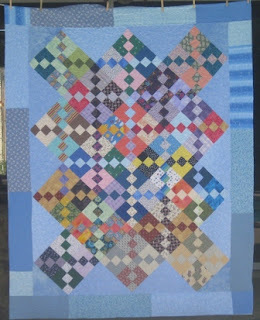 I'm thinking of an alternating up and down sort of angle, much like the one on this quilt. I am leaning toward stitching the names of the blocks below as they were in the original quilt, though I think I'll do it by machine. Above those are the baskets that I took along to stitch when the midgets were done along with 4 cheddar bowties that I am thinking of for a new leaders and enders project. Bonnie has put out a challenge, and there is nothing more fun than a quilt-along. That means of course that I should finish off an old leaders and enders to make room, so I worked on the nine patches yesterday. 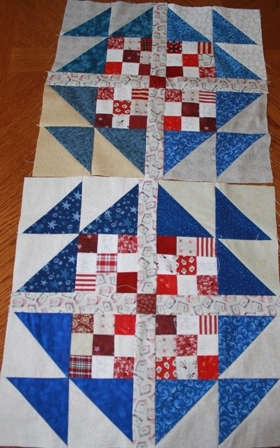 I also got all the half square triangles done for the red white and blue quilt that is my Rainbow Scrap Challenge project for July. 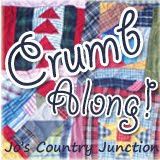 To see what everyone else is up to, go over to Judy's blog at Patchwork Times. I guess I knew it was Saturday in theory. Somehow while traveling, the days of the week seem a little jumbled. It occurred to me about the time I was boarding my flight that I hadn't posted any linkies yet. Sorry about that. So it may be a bit more of Scraphappy Sunday than Saturday this week, but I am hopeful that things will settle down very soon. The good news is that I am FINALLY home again!! Here is the third Birdie Block my Mom. Now she is starting to worry about running out of patterns to keep her busy until the next block of the month comes out. I went online this morning and showed her some patterns in various styles and she picked out some vintage victorian looking children from a redwork site. I think I'll start tracing a few of those out for her and sending them in greeting cards. That should keep her going for a while! 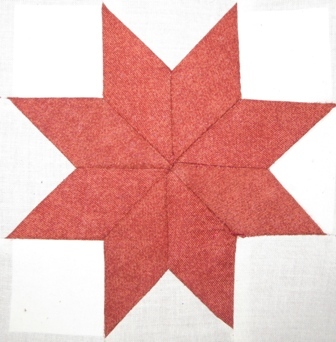 I just finished Midget Block 118 which is called Star. 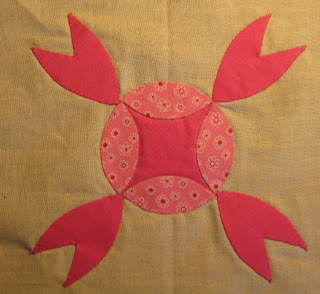 It has 16 pieces and was hand pieced using freezer paper templates. Today is my last full day in Georgia. I am going to a special olympics baseball game in the morning with my sister and then heading to the airport in the afternoon. I've finished all the midgets I had ready to go, so the basket blocks will keep me busy on the way home. 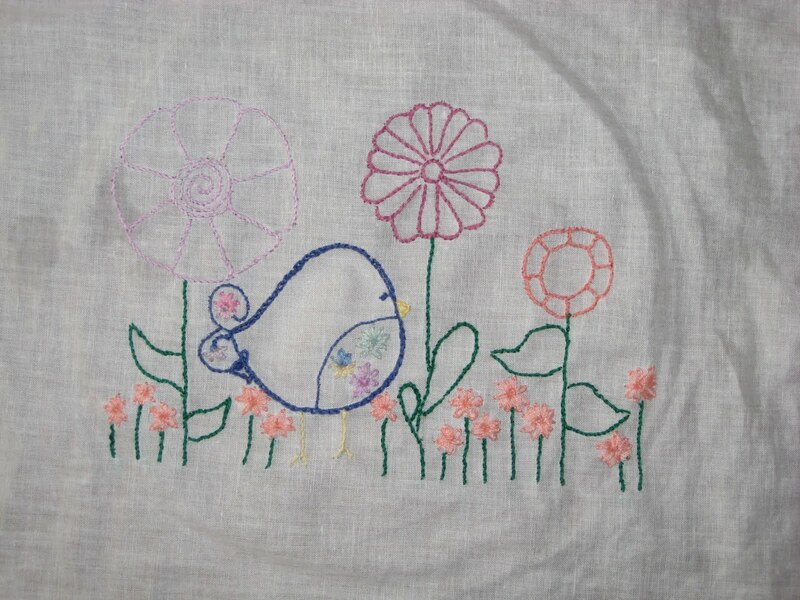 Mom just finished her SECOND little birdie stitchery. She is changing up the colors and making it her own. Best of all, she is settled down to rest and was NOT jumping up to pace every few minutes. We did take a nice walk this evening after it cooled off, she had only gone to the mailbox before today, but we made it accross the street and down THREE mailboxes. Tomorrow we will try for four. She is thankful for all the wishes and thoughts and prayers. My sincere thanks go out for everyone for their support. I've been working steadily away at my Midgets while travelling these past two weeks. There is just one more left undone which should last for the trip home. 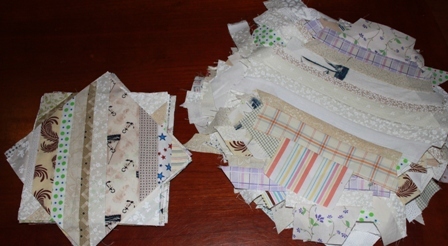 These are all applique or hand pieced blocks that I prepped before we left home years and years ago. So now, without further ado, the Midget Madness Parade! This block was English Paper Pieced. I started it at Thanksgiving, worked a bit more at Christmas and finally gave up and called it done on Summer Vacation. I'm still not sure how hexagons can turn into a square, but I'm done worrying about it. It is number 58 and is called Diamond Field. This one was appliqued onto four squares and then trimmed down before being sewn together. It is called Twist and Turn and is number 66. 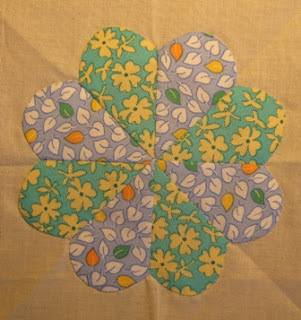 This one was nice and simple, just like an easier Dresden Plate really. 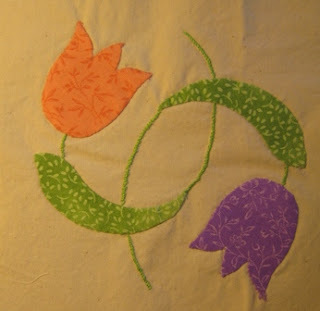 I used freezer paper to round the corners and then hand pieced the wedges before applying it to background fabric. It is called Four Leaf clover and is number 70. This one was straight forward applique. It is called Bride and is number 74. This one is Tempting Tulip and is number 87. 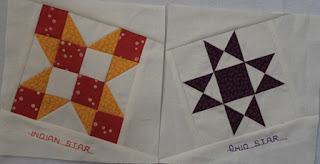 I feel a little funny about the blocks that were not part of the original quilt. I think they are cute, but it does seem like cheating to use these instead of the original patterns. Dotty Daisy is number 88 and is also not from the original quilt. Block 97 is called Western Rose. I'm tickled pink with the way it turned out. Block 119 is called Carolina Favorite. It is one of those blocks that uses applique of squares that have already been sewn together into four patches. 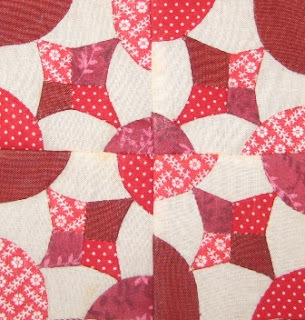 I think this is a really pretty block. It was supposed to have the little outer petals split into two colors, but I simplified it just a bit and I think it turned out fine. It is one of the few blocks that didn't use a solid colored background fabric so I hope it doesn't stand out in the end. So far I have completed 53 blocks with a total of 1645 pieces. That's it for the Midgets on Parade. Now I just have to go back and do the pieced blocks in between. I showed Mom the adorable stitchery patterns that were suggested after my last post and she chose these sweet BOMs from Little Miss Shabby. 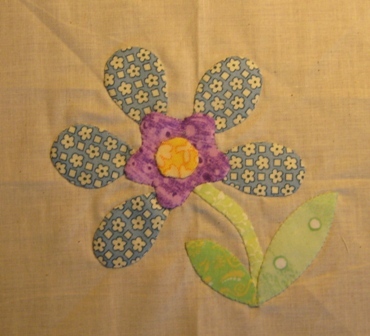 I traced a few out onto fabric and she settled down yesterday to start stitching away. 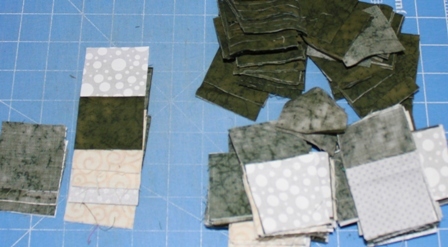 Her plan is for her to stitch out enough blocks so that I can set them into a quilt for her. Best of all, it kept her busy and happy for an entire day and we are now one day more past her surgery. Each day gets better as she gets stronger and healtier. Pathology results came back today and they were all excellent. Things are going great in Georgia with Mom. She is doing fabulous post surgery and quickly recovering from the nasty side effects of chemotherapy. We were all at a loss as to how we could keep her settled and still for any period of time. She is usually moving constantly and FULL of nervous energy. I told her that she seriously needed a hobby to keep her busy while she recuperates. I had tried to teach her crochet last time I was here without luck, and she hasn't had the attention span to focus on books or movies. Eventually she remembered that she used to really enjoy embroidery. We found some old supplies along with a partially finished project in a closet and after a little remembering, she was off. She doesn't want any pictures taken right now, but it was a beautiful sight to see her settled in and stitching away. So if anyone knows where I con find some cute stitchety patterns for her to work on next, please let me know. I have a folder on my computer at home, but it would be nice to get a few things ready for her before I go. I am currently in Sharpsbug Georgia with my husband's borther's family waiting for my sister to come and fetch me to go and help with Mom. She is doing amazingly well after her surgery and is settled in at home healing. I was happy to see that the mister inky showed up as scheduled, but it does seem to have added last weeks posts as well as this weeks. So if you are checking out what everyone is up to, just start at the end and go backwards until you see something familiar. 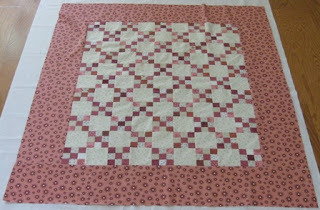 Although still without camera, I have gotten quite a bit done on vacation, I have most of two Bonnie Hunter quilts cut out and sent home to Florida. I've finished 4 more midget blocks and gotten all the prep work done on several more. I'm sure there will be some quiet time during the next week to chip away at those as well. I hope everyone is having a safe and happy weekend. I'm not sure where I'll be on July 16, so I'm scheduling this ahead of time. I should be in transit from Destin to either Atlanta or Florida, I'll try to check in when I arrive. 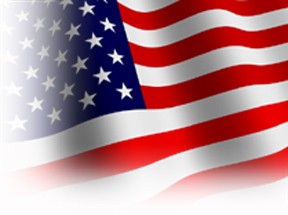 Until then see how everyone is doing with their own versions of patriotic colors. One day seems to blend into the next on vacation. We have a routine of getting up for breakfast before heading down to the beach. We have sprinkled in a couple of outings for variety. Tuesaday was a water park and today we have rented a boat. Although I've taken a few pictures, I didn't bring a computer and so will wait to go through those until I get home. 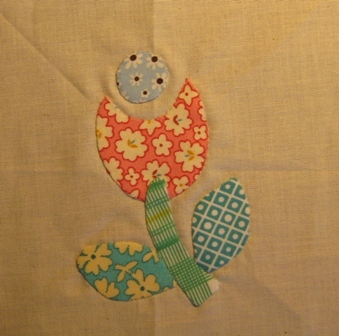 I have spent evenings after the kids are in bed working an midget appliqué. 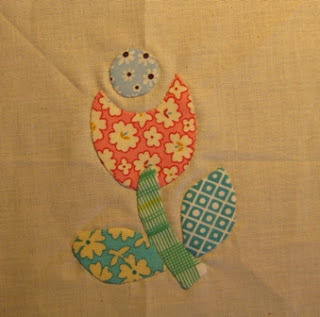 I hate to work out of order, but it is worth it to have tiny little bits of sewing to keep me busy. Mom's surgery was yesterday, everything seems to have gone well. It was quite late before they were done though and the surgeon will update us all today. I think I'll go straight up from here rather than driving home first and catching a flight back. I've got a trial block made for a red white and blue quilt. The pattern is one from Bonnie Hunter's new book and it will go nicely with the red and blue nine patches that I had already made. Use the misterlinky below to post your patriotic progress. When the kids started to pack up for vacation, they loaded up on swimsuits and counted out underwear. The first thing I did was to pick a project to carry along. I've still got my little baskets for handwork, but I also wanted to have a project for evenings in the hotel room. 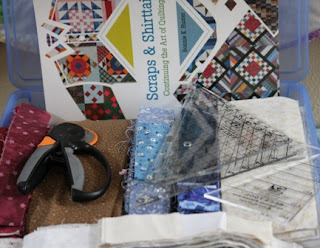 There are two projects from Bonnie Hunters new book that both use 1.5 inch and 3.5 inch strips. I am planning one in blue and brown and one in blue red and white. We spent the morning watching the shuttle launch. There was a lot of low cloud cover, so it wasn't visible for very long. 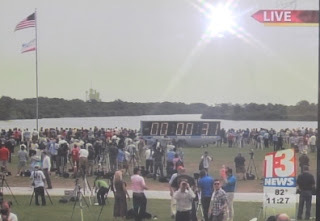 It is the last launch ever though, so we had to see it go up. I'll miss being able to pop out into the front yard and see them go up. After that we all went out to a movie and then came home to finish packing. Mom's surgery is scheduled for next week so the tentative plan is for me to catch a ride to Atlanta with the in-laws to help mom out. She has a girlfriend coming to stay with her for the first few days and then the plan is for me to stay for the next week or so. 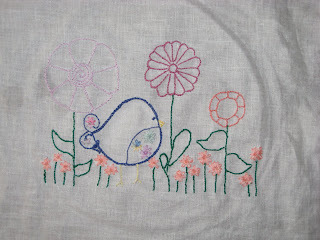 The little pink nine patches came from the Rainbow Scrap Challenge. I'm sure someone will have a baby girl eventually. I think I'll get this loaded up on the frame and think about how I'd like to quilt it. First though, I'd better do a little tidying up around the house. Kurt started laundry while I was at the store yesterday, but there is still that general post trip clutter, mail and newspaper backup to deal with. I guess I should think about dinner too. Just pulled the Carolina Crossroads quilt off the frame. 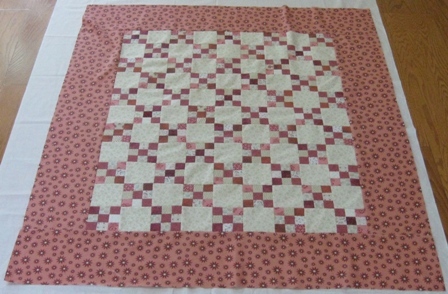 It was a Bonnie Hunter scrap user pattern from Quiltmaker Magazine. I didn't put a lot of thought into color selection as I was just "trying out" a pattern. 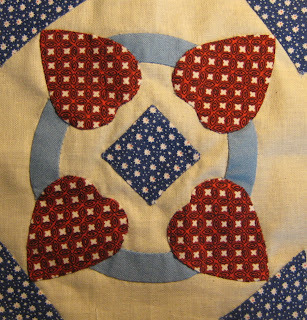 Still, it is a quilt now. I was calling it Scraptastrophy while it was in progress, but when I looked back at earlier entries I realized that I was calling it Hopscotch before. That seems like a nicer name. 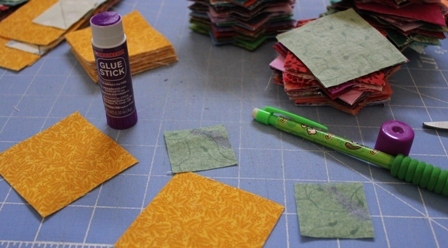 I think I'll see if I have any orphan blue binding hanging out so I can finish it off officially. We made it back from Georgia yesterday and then went out to enjoy the fireworks and symphony at Cocoa Beach. We met up with some friends there and had a very nice time. I think everyone will be happy to have a quiet day at home now and recuperate from all the activity. It is so easy to lose track of the days when out of town. I didn't realize it was Saturday until I checked e-mail to see people wondering where Mr. Linky was. OOPS! I don't have anything to show yet, but next week should be calm. I have lots of red white and blue running through my head. How about you? Any patriotic plans in the works? Today is a brand new month. For those of us here in the US, that means red, white and blue. 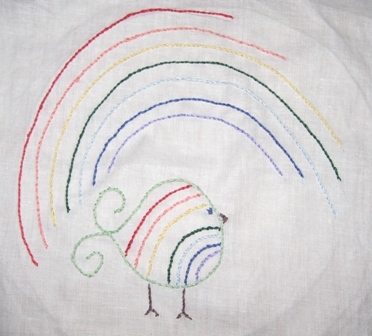 If you live somewhere else, feel free to use your own patriotic combination for the Rainbow Scrap Challenge. 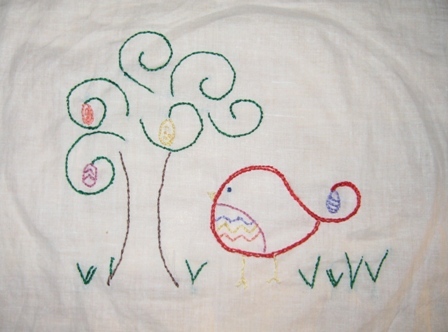 I've been eying Goose in the Pond from Bonnie's new book, it would look great with the 9 patches I've been working on for a while. What have you got on the back burner? Anything in red, white or blue?